Savor the best of summer produce with this tomato, watermelon, feta salad served with roasted salmon. The beginning of summer might have been marked by a tropical storm along with the accompanying gray skies and rain but that isn’t going to keep me from jumping into watermelon recipes now that watermelons have finally started appearing at the farmers market. After all, I have been waiting since the end of last summer to share this recipe. I discovered this tomato, watermelon, feta salad just as tomatoes and watermelons were going out of season last year so I was thrilled when they both re-appeared at the market last week. Fresh tomatoes and watermelon are two of my favorite summer time produce but I honestly had never thought about putting the two together. Watermelon doesn’t exactly scream salad. But trust me when I tell you the tomato-watermelon combination totally works in this salad thanks to some crumbled feta and aged balsamic vinegar to tie all the savory, sweet, and salty flavors together. Use a good quality balsamic vinegar for this salad. It doesn’t have to be super expensive to be good but do look for one that is slightly thick and sweet. Since it’s summer and I want to keep dinners as simple as possible, I decided to pair this tomato, watermelon, feta salad with some roasted salmon. As history has shown, I’m a big fan of pairing salmon with fruit salsas and salads. You could also grill the salmon to really make this recipe feel like summer. Now, if I could just get these rain clouds to clear out. In a medium bowl, toss together the tomatoes, watermelon, basil, olive oil, balsamic vinegar, and a generous pinch each of salt and pepper. Taste and add more vinegar, salt, and pepper as desired. Sprinkle feta over the salad. Set aside. Heat oven to 350 degrees. Season salmon fillets with salt and pepper and place on a foil lined baking sheet. Roast salmon in oven for 15-20 minutes or until salmon is cooked through. To serve, divide salad among 4 serving plates and top with salmon fillets. Thank you. 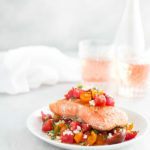 The colors of the tomatoes and watermelon against the salmon made this a fun dish to style.